Location, location, location. Ask any of the thousands of students heading off to college this year, and you are bound to hear that the location of the campus played a major part in their final decision. While some prefer beautiful rural locations surrounded by acres of nature, others prefer urban campuses in the midst of restaurants, museums, and crowds. Traditional ideas of college years may favor the former, but those who prefer the latter need not give up the classical college feel. 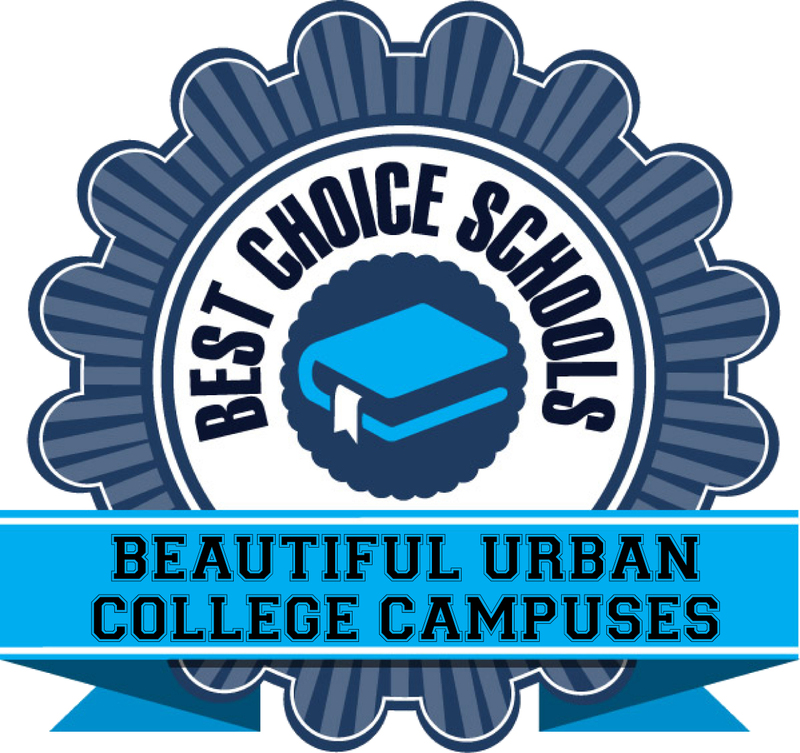 The schools on this list represent the 50 most beautiful urban college campuses in the United States. They were chosen and ranked based on the following criteria. Location: Each campus on this list is located in a city with a population of more than 100,000 people. Awards & Recognition (2 points for an international accolade; 1 point for an American accolade; 1 point for appearing on the National Register of Historic Places): Whether a national award or an honor bestowed by a group or organization, any recognition a campus has received played a large part in its placement on this list. Generally speaking, the larger and more recent the honor, the higher the college was placed. Student Enjoyment (1 point per notable feature): While most of the on-campus features described in this article can be appreciated visually by both students and visitors, those campuses with features that can be physically enjoyed by the school’s student body (such as botanical gardens) were given higher priority. Number of Notable Features (1 point per feature): Campuses with more than one significant or celebrated building or feature were ranked higher than those with a single notable feature. Other (1 point each): Those campuses with other notable characteristics such as historical significance or environment friendliness, were also considered. In the event of a tie, the higher-ranking campus was chosen by the author based on characteristics such as natural terrain and climate, historical significance, and academic reputation. Like so much of the beautiful city it calls home, University of California–San Diego was built in the iconic Spanish Renaissance architectural style. Students and visitors can stroll through campus on palm tree-lined walkways, while the warm southern California sunshine warms the terra cotta rooftops and frequent grassy spaces. Many of the university’s residence halls and academic buildings boast panoramic views of the Pacific Ocean, and students can easily choose to study or socialize at the beach, located only a short walk or bike ride from campus. 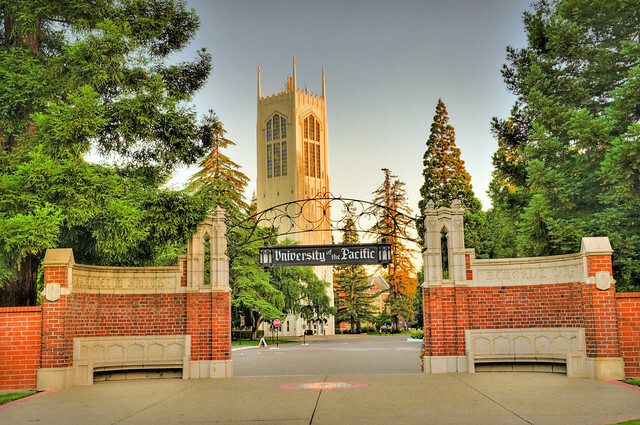 Originally founded as California Wesleyan College, the now University of the Pacific is one of the top-ranked institutions in California. The 175-acre campus is full of natural beauty in the form of tree-lined walkways and flower gardens. The most commonly recognized symbol of campus is Burns Tower. The neo-Gothic tower can be heard from miles around when its carillon of 122 bells begins to chime. It’s nice to look at, too; made from concrete and steel, and decorated with bright stained-glass windows, Burns Tower was completed in 1964 by the architects Howard G. Bissell and Glen H. Mortensen. The northern California campus also serves as a movie set. Movies filmed at the school include High Time, Raiders of the Lost Ark, and The Sure Thing. Much newer than so many of the other Massachusetts institutions (because of the Civil War, classes didn’t begin until 1865), Massachusetts Institute of Technology (MIT) wasted no time in developing a reputation as a beautiful college campus. In fact, much of the current 170-acre campus was designed by MIT alumnus William Welles Bosworth. Bosworth’s iconic, Pantheon-inspired Great Dome adds a certain level of grandeur, while more contemporary campus highlights include the impressive Ray and Maria State Center for Computer, Information, and Intelligence Sciences. When not in class, students can spend the lovely New England days studying in Killian Court, a green expanse perfect for studying or socializing. Thanks to its pledge to commission only leading architects to design its buildings, University of Cincinnati is a unique collection of imposing, beautiful, and modern structures. The 473-acre campus was described by Travel & Leisure as “strikingly modern.” One of its most iconic buildings is the Vontz Center for Molecular Studies. Completed in 1999, the center is mostly modern, with distinctive red brick sections. Equally impressive is the Engineering Research Center, designed by alumnus Michael Graves. Finished in 1994, it resembles a four-cylinder engine, a playful nod to the industrial midwestern city. Brooklyn College was founded in 1930, and has since then been a gem of the Brooklyn cityscape. Much of the campus was designed by architect Randolph Evans, who was largely inspired by Thomas Jefferson’s University of Virginia. The college is built mostly in the neo-Georgian style and consists of a number of impressive red-brick buildings, the most notable of which are Ingersoll Hall and LaGuardia Hall. The latter, an eye-catching clock tower erected in 1937, is the centerpiece of the grassy quad. Though the campus consists of only 26 acres, it includes a peaceful lily pond surrounded by blooming cherry trees. Located in Dallas, Texas, Southern Methodist University is 164 tranquil acres of Georgian architecture, spacious lawns, and tree-lined walkways. The magnificent Dallas Hall, dedicated with the start of classes in 1915, was designed by Boston-based architects Shepley, Rutan and Coolidge. Its grand Georgian design was directly inspired by Thomas Jefferson’s famous Rotunda at the University of Virginia. Despite its location on a campus full of beautiful buildings, Dallas Hall remains Southern Methodist University’s most iconic landmark. Despite being located in one of the largest cities in Texas, University of Houston is 667-acres of green, lush, sculpture-adorned grounds. One of the state’s most beautiful schools has as its centerpiece the Ezekiel W. Cullen Building. Completed in 1950, it was designed by local architect Alfred C. Finn in the Art Deco style. Today, it’s surrounded by the Cullen Family Plaza, a beautiful green space that is a popular meet-up spot. Nearby is Jim Sanborn’s bronze and copper sculpture, AA, which is etched with excerpts from literature in a variety of languages. The sculpture is just one of many on campus, and is appropriately located beside the M.D. Anderson Library. Students at University of Minnesota have the privilege of attending a top-ranked public Ivy located in the so-called “happiest city in America.” But even if that weren’t enough, the school boasts unique aesthetic elements. Students can enjoy gorgeous views from the Washington Avenue Bridge while crossing from the laid-back St. Paul side of campus to the more cosmopolitan Minneapolis. On campus, students and visitors alike can enjoy great facilities such as the Frederick R. Weisman Art Museum, and the Old Campus Historic District, which includes 1889’s Pillsbury Hall, the oldest building on campus. Mercer University’s main campus may be located in stylish downtown Macon, Georgia, but its true architectural gem sits a mile away. The Walter F. George School of Law is an exceptionally stunning building built in the Renaissance Revival style. Complete with white pillars and an imposing clock tower, one can’t help but think about another iconic structure: Philadelphia’s Independence Hall, by which the School of Law was inspired. Nearby sits Woodruff House, a Greek Revival antebellum home. Designed in 1836 by local architect Elam Alexander, Woodruff House is listed on the National Register of Historic Places. Ivy League institution Columbia University is ideally located in Manhattan’s Upper West Side, bordering Harlem. Despite its urban location, this “Morningside Heights” campus is undoubtedly one of the most beautiful in the city. Designed in the Beaux-Arts style by architects McKim, Mead & White, Columbia consists of 32 acres of grand neoclassical aesthetics. Perhaps most iconic are the libraries. Low Memorial Library, completed in 1895, is clearly inspired by Rome’s Pantheon, while the columned Butler Library appears on countless postcards. For students who enjoy sailing, windsurfing, and wakeboarding, there may be no better choice of college than University of Wisconsin–Madison. The 936-acre campus is situated right between two massive lakes, Mendota and Monoma, thereby offering four seasons of extra-curricular activities for students. For those who prefer on-land adventures, the capitol building is located only a few miles away, with plenty of shopping and restaurants in between. On campus are located four national landmarks, the most famous of which is undoubtedly Bascom Hall, a hub for student life. A botanic garden, home to more than 500 species of plants and trees, adds a burst of life to the university grounds. Staten Island-based liberal arts school Wagner College may not be as well known as the Ivy Leagues, but the 110-acre campus could certainly rival the bigger schools in terms of beautiful Collegiate Gothic architecture. Main Hall, completed in 1930 by local architect George W. Conable, is magnificently turreted and has become Wagner’s most iconic building. Cunard Hall, built in the 1850s to resemble an Italian villa, was once the home of shipping tycoon Edward Cunard, giving Wagner a unique historical significance as well. Both of these buildings are framed by Sutter Oval, a lush green space popular for studying and socializing. Wagner also boasts easily accessible panoramic views of New York Harbor, an enjoyable feature that no other school on this list can claim. Indiana University’s 1,937-acre campus is located in Bloomington, Indiana. Indiana is one of the states that has been built upon large sheets of limestone, and not surprisingly, the material figures prominently in many of the University’s most iconic buildings, including Sample Gates, the elegant entryway onto campus. The university’s administration offices are housed in centrally located Maxwell Hall, which features a stunning limestone facade and a soaring clock tower. The large campus has plenty to offer the nature lover, too. Dunn’s Woods is a lovely tree-lined space complete with walking trails for both students and visitors to enjoy. Chartered in 1795, much of Union College was developed in the early 1800s by famed French architect Joseph-Jacques Ramée. The 120-acre campus is lush with gardens, trees, and tree-lined walking paths, all of which combine to create a peaceful and study-friendly atmosphere within the busy city. The campus’ most beautiful building is arguably Nott Memorial. But the multi-hued stone structure, designed by Union College alumnus Edward Tuckerman Potter, is not only impressive to look at. It has the unique accomplishment of being one of only a few 16-sided buildings on earth. Though Fordham University has three locations throughout New York City, its Rose Hill campus in the Bronx is arguably the most beautiful. Multiple gardens and greens grace the 85-acre campus, the most popular one for studying and socializing being the expansive Martyrs’ Lawn. Roses bloom for much of the year around most of the university’s buildings, including the campus crown jewel: Keating Hall. Sitting adjacent to the greenery of Edwards Parade, the neo-Gothic structure was designed by local architect Robert J. Reiley and constructed in 1936. Though university of Louisville boasts impressively large and modern sports complexes such as the Yum! 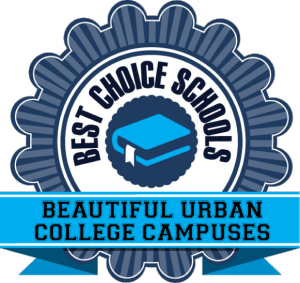 Center and Papa John’s Stadium, it includes enough southern historical charm to earn it a solid spot on this list of most beautiful schools in urban settings. Located in Old Louisville, UofL is surrounded by the largest grouping of Victorian homes in the United States — many of which have been converted into studios and apartments occupied by students. 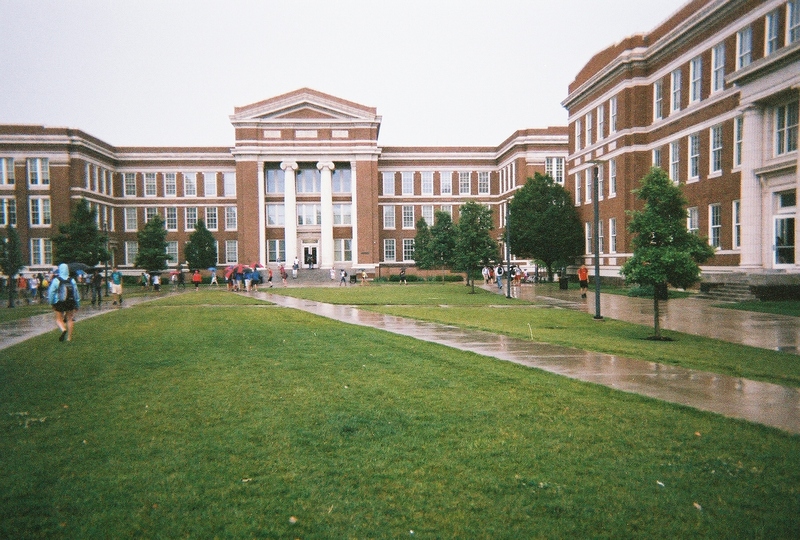 The University has continued to purchase large tracts of Louisville land to preserve as part of the University, among which has been the Speed Art Museum and the Confederate Civil War Monument. The campus is also close to both downtown Louisville and favorite locals’ hangout Bardstown Road, where frequent riverfront events, world-class restaurants, and top-ranked museums are sure to keep anyone busy. The 1,000 acres comprising Baylor University are dotted with beautiful sights both natural and man-made. The centerpiece of the campus is undoubtedly Burleson Quadrangle. First created in 1886, the Quad is hugely popular among students and visitors alike. Plus, sitting in the Quad gives ones spectacular views of some of the campus’ most beautiful buildings, most notable of which is Old Main. Constructed in 1887, Old Main combines Italianate and American Victorian features. One of the top public universities in the country, University of Colorado at Boulder is also one of the most beautiful. The campus sits at the base of the Rocky Mountain foothills, providing amazing views from just about anywhere. Many of the buildings on campus were designed by Charles Klauder in the Tuscan Vernacular Revival style. A rugged look appropriate for Colorado, this type of architecture is characterized by its use of local sandstone, limestone, and unique embellishments such as red-tiled roofs. The campus also includes more traditional, neo-Gothic collegiate-type architecture, including the Mackey Auditorium and the historic Old Main, the first building on campus. Northeastern University is located in Boston’s Fenway Cultural District, near Fenway Park, Roxbury and Back Bay neighborhoods, the Museum of Fine Arts, and Symphony Hall. Despite the urban locale, Northeastern is filled with trees, flowers, and grassy quads. Twice has Northeastern won the American Institute of Architects’ award for “Most Beautiful New or Renovated Exterior Space” (2001 and 2004), while two of its buildings, International Village residence hall and Dockser Hall, have recently gained LEED Gold building status. Harvard was established in 1636, and is the oldest university in the United States. Located only a few miles from downtown Boston, the 209-acre campus is within easy distance to just about any city luxury. Students still room in some of the university’s most historic buildings, many of which contain dining halls, tutoring suites, libraries, and other student facilities. As far as historic academic buildings, Harvard has many. Memorial Hall, building in 1877 in the high Victorian gothic style, is one of the best of its kind on the list of U.S. National Historic Landmarks. In fact, famous author (and Harvard law school student) Henry James called it “a great, bristling brick Valhalla.” Other notable Harvard buildings include Sever Hall and University Hall. Located just seven miles from downtown, University of Chicago is a beautiful mix of collegiate and cosmopolitan. A number of elegant, English university-style buildings adorn the 211-acre campus, several of which are on the National Register of Historic Places. One of the most famous of these buildings is the Rockefeller Chapel, a magnificent building donated by the Rockefeller family. Despite the urban location, nature lovers are sure to feel right at home on the University of Chicago campus. The school has its own botanical garden, complete with a pond for ducks, dragonflies, and turtles. Situated within New Orleans, Tulane is a quintessentially southern university in one of the most southern of cities. The 100-acre campus is an assortment of oak-lined green spaces and graceful buildings, nearly all of which have been designed in different styles. Most notable, however, is the facade of Gibson Hall, Tulane’s inaugural building, which was completed in 1894 by the local firm Harrod and Andry. The elegant stone facade is described as Richardsonian Romanesque, and has been listed on the National Register of Historical Places for more than 35 years. Centrally located in the nation’s capital, Georgetown University’s campus may well include Washington D.C.’s many museums, theaters, concert halls, monuments, and landmarks. This makes the university an especially exciting place to be. Still, the official campus has its own fair share of impressive constructions. Healy Hall, built in the 1870s, is listed as a National Historic Landmark, while the iconic Observatory has its own rightful spot on the National Register of Historic Places (in 1846, the Observatory was used to determine the coordinates of Washington, D.C.). Finally, beautiful Old North, built in 1794, is the oldest building on campus. If you’re walking through any part of Rhodes College, you’re likely to think you have somehow left Memphis, Tennessee and found your way to old England. That’s because the 100-acre campus was designed to resemble an English Gothic village. Originally founded in 1925, Rhodes’ Oxbridge-style quad is crowned by an imposing stone library. But it’s the Avenue of the Oaks that secures Rhodes a spot amongst the most beautiful of college campuses. When the college moved to Memphis from nearby Clarksville, student John A. Rollow brought with him a collection of oak tree seedlings. Rollow’s Avenue of the Oaks now runs from North Parkway to Palmer Hall and is the crowning jewel of an already gorgeous campus. Despite its location in the downtown Houston Museum District, Rice University manages to be 295 acres of historic buildings, lush greens, and beautiful wooded areas. Thanks to Rice’s first president, nearly every building built over the years has been designed and crafted in the Byzantine style. As a result, Rice is a flowing expanse of sand- and pink-colored brick, columns, and archways. One of the campus’ jewels is undoubtedly the Lynn R. Lowrey Arboretum. Home to more than 4,200 plants, shrubs, and trees, the arboretum is a popular draw for visitors and students alike, the latter of whom have made the space a popular study spot. Uniquely, University of Southern California has been built up over the years according to not one, but two master plans. Its spot on this list is surely thanks to the developers of the second plan, who strove to complete buildings in harmony with those already on campus. The result is 229 acres of beautiful Romanesque Revivals, one of the most appealing of which is the Edward L. Doheny Jr. Memorial Library. The library features gorgeously ornate embellishments including limestone marble accents, detailed ceilings, and graceful chandeliers. Though New College of Florida wasn’t founded until the early 1960s, its bayfront position, panoramic views, and magnificent scenery make it one of the most beautiful urban campuses in the nation. The architectural gems of the 110-acre campus are three former mansions which now serve as the college’s centerpieces: College Hall, Cook Hall, and Caples Mansion. College Hall, with its Etowah marble front and perfectly landscaped lawn, may just be the most beautiful of the three. Today it houses faculty areas, classrooms, and an admission reception, but was originally built as a mansion for Charles Ringling of circus fame. Completed between 1926 and 1930, all three of the mansions are listed on the National Register of Historic Places. Situated in Westchester at the base of Los Angeles’ Del Rey Hills, Loyola Marymount University is surrounded by views reminiscent of Hollywood backdrops. The university itself dates back to 1865, when it was originally founded as Catholic St. Vincent’s College. Not surprisingly, much of the campus architecture pays tribute to the school’s religious roots and continuing Catholic affiliation. The elegant Sacred Heart Chapel is one of several highlights on the 150-acre campus. Built in 1955, people travel from just about everywhere to view the Spanish Gothic structure and its multi-hued stained-glass windows, marble pillars, and sparkling chandeliers. Though Boston College was instituted in 1863, the 175-acre campus we know today was designed in 1909 by architect Charles Donagh Maginnis. Maginnis’ Collegiate Gothic and Gothic Revival style is considered to have been the pioneering force behind the incorporation of such architecture at several other prestigious schools in the area. Today there stand a number of beautiful stone structures on the Boston campus, the most famous of which is likely Gasson Hall. With its iconic bell tower and adjacent eagle sculpture, Gasson Hall is one of six buildings that form the Boston College Main Campus Historic District. Washington University in St. Louis is one of the most prestigious research universities in the country. Divided into eleven locations around the All-American city of St. Louis, the university totals over 11 million square feet of beautiful and historic buildings, many of which were designed in the grand Collegiate Gothic style similar to those seen at Oxford, Cambridge, and other English universities. Some of the most notable buildings on campus include Seigle Hall, Francis Field (a site of the 1904 Olympic Games), and Danforth University Center. Another favorite is undoubtedly the Benjamin Brown Graham Chapel, built in 1909. With its red granite stone and gorgeous stained-glass windows, the chapel was designed as a counterpart to the one at prestigious British boarding school Eton College. Located in one of Atlanta’s oldest neighborhoods, Emory University is chock-full of southern charm. Much of the campus consists of Lullwater Park, a 100+ acre space dedicated to preserving the natural environment of the South. Students can enjoy the many hiking and walking trails, as well as views of the university president’s Tudor-style mansion. In the center of campus, the quad is flanked by a number of historic buildings, the most notable of which is the ornate Pitts Theology Library, which has been included in the National Register of Historic Places. While most universities on this list are considered beautiful because of ivy-covered buildings considered more traditional, Illinois Institute of Technology’s innovative, modern buildings break the mold. Much of the campus was designed by modernist architect Ludwig Mies van der Rohe, who was inspired by the city’s many factories and warehouses. Thus, most of the main buildings are not brick, but more industrial in nature. In fact, Ludwig’s crowning achievement may just be the Institute’s College of Architecture. The structure is made entirely of steel and glass and is so iconic that it was made a National Historic Landmark in 2001. With its hallmark red-tiled roofs and Mediterranean-style buildings, it’s no wonder Occidental College consistently ranks among the most beautiful college campuses in the country. Myron Hunt, the famed American architect who designed the nearby Rose Bowl, designed many of Occidental’s original buildings, most of which are still used as academic buildings today. Fowler Hall, Swan Hall, and Johnson Hall, all completed in 1914, form the iconic original trio of Beaux-Arts buildings. Other notable buildings include the 42,000-square foot Hameetman Science Center (2003) and the popular Erdman Hall (1927). Out of all the schools on this list, Point Loma Nazarene University may have the most unique background. Originally the site of a Theosophical commune called Lomaland, much of the architecture on the 90-acre campus dates back to this interesting time. Most notable is the stunning Greek theater that was constructed in 1901. The only one of its kind on the continent, the theater is a popular attraction for both students and visitors. Another magnificent campus building is Mieras Hall. An eye-catching focal point, Mieras blends Victorian timber design with unusual shapes and antiquated details such as Corinthian-style columns and an amethyst dome. Though located within the huge metropolitan area of Nashville, Tennessee, Vanderbilt University’s campus has been described as being like “walking into the 1700s.” The peaceful 300-acre campus doubles as an arboretum in which 170 species of trees can be found, and birds such as hawks, owls, and cardinals are spotted frequently, along with other forms of small wildlife. But it’s not just natural beauty for which Vanderbilt is known. The Italianate-style Kirkland Hall serves as the campus’ orientating landmark and the official welcome for Vanderbilt’s thousands of visitors each year. With its many Collegiate Gothic buildings, Yale University has a remarkably Medieval feel to it. The 837-acre campus is packed with impressive structures such as Connecticut Hall (built in 1750!) and the Gothic Revival-style Sterling Memorial Library. Designed by American architect James Gamble Rogers, the library is gorgeously detailed with reliefs, gargoyles, and thousands of stained-glass windowpanes. Yale has also made a large effort to become environmentally responsible; it currently has eleven buildings eligible for LEED design and certification. Founded in 1851, long before the city of Santa Clara was the tech capital it is today, Santa Clara University is now 106 acres of peaceful palm trees and California Mission-style architecture. The Ricard Observatory is one of the favorite buildings on campus. Completed in 1928, the silver-domed building is still both functional and charming. The Student Activities Center was only completed in 2010, but has quickly become one of the more iconic buildings on campus. The center is beautiful to look at, and recently earned an LEED Gold certification for its myriad green features which include low-emissions finishes and brick-paved walkways that limit water runoff. The all-women campus of Scripps College is 37 acres of rich beauty. The campus is characterized by buildings in the Spanish Colonial Revival style, adding to an overall Mediterranean feel. Most of the buildings were designed around the time of the college’s founding in 1926 by groundbreaking English-American architect Gordon Kaufmann. Thanks to this connection, Scripps has earned a spot on the U.S. National Register of Historic Places. Scripps also boasts plenty of natural beauty. Orange, grapefruit, and kumquat trees line the campus, while blooming rose gardens abound. Students especially enjoy taking a quiet moment to think or study in the Margaret Fowler Garden, complete with a small pond and Mediterranean-style wall. Smith College’s campus was originally designed as an arboretum and botanic garden by famed landscape architect Frederick Law Olmsted. Though Smith’s academic buildings are beautiful in their own right, his natural elements are truly the gems of the campus. More than 1,200 different kinds of shrubs, plants, and trees brighten the college’s 147 acres, while multiple gardens offer students places to study and reflect. One of the most idyllic features on campus is the aptly named Paradise Pond. Surrounded by stunning plant life, the pond is a lovely place where students can take a quiet moment to sit at the water’s edge. University of Washington is located in what is easily one of the most stunning natural settings of any campus in the United States. From just about anywhere on campus, students can enjoy amazing views of Mount Rainier, the Cascade Range, and the Olympic Mountains. The focal point of the 703-acre campus is the cherry tree-lined quad. Adjacent to this is Denny Hall, the oldest building on campus. Built in 1895, Denny Hall was designed by Charles Saunders, and built with Tenino sandstone in the French Renaissance Revival style. Pretty Belmont University is steeped in Southern charm and beauty. The most beautiful building on the 75-acre campus is arguably Belmont Mansion. Once the home of local socialite Adelicia Acklen, it earned a spot on the National Register of Historic Places in 1971. With its Greek Revival architecture and Italianate details, the mansion remains one of the most opulent antebellum residences in the southern United States. It currently acts as a showpiece and museum for the university. Another historic highlight is Belmont’s 105-foot tower and carillon, both of which were built in 1853. Located on 240 acres on the edge of Lake Michigan, Northwestern University is an expanse of greenery, trees and flowers, and historic buildings. Students who enjoy yachting, kayaking, and diving will especially enjoy the easy access to water and beach. As for man-made beauty, University Hall, built in 1869, is the oldest building on campus. The Victorian Gothic-style building was built in 1869 with Joliet limestone, and is the centerpiece of the campus’s “historical” side. On the more modern side of campus sits the imposing University Library, built in the Brutalist style in 1970. Together, these two buildings symbolize the unique style that can be seen throughout the campus. Not only did The Princeton Review refer to College of the Holy Cross as “exceptionally beautiful,” it has named it one of the top five most beautiful campuses in the country every year since 2010. And exceptionally beautiful it is. The 174-acre campus is, in its entirely, actually a registered arboretum, boasting more than 6,000 trees, plants, and shrubs that add unique color and elegance to any part of campus. Towering Fenwick Hall serves as the campus’ centerpiece, while the jewel of Holy Cross is undoubtedly St. Joseph Memorial Chapel. Constructed in 1922, the chapel features graceful Corinthian columns and a Renaissance Revival aesthetic. Vassar College is an official arboretum, and is therefore home to hundreds of varieties of trees and indigenous plants. Ecological preserves, gardens, and green spaces abound on the 1,000-acre campus. More than 100 buildings grace the campus, many of which come in eye-catching styles by some of history’s most noted architects. The campus’ crown jewel is arguably the castle-like Thompson Memorial Library. Built in 1905 by the architects Allen & Collins, the library is an iconic Perpendicular Gothic creation that has since received several interesting additions and renovations. Take a walk through the University of Notre Dame campus, and you may think you’ve stepped onto the grounds of an old English university. The 1,250-acre campus is filled with tree-lined walkways and hidden garden areas. Notre Dame’s most famous building is undoubtedly the golden-domed Main Building, though its most magnificent is the neo-Gothic Basilica of the Sacred Heart. Consisting of a towering, national record-breaking bell tower and large stained-glass windows, the basilica is almost always featured on list of stunning churches in the United States. Duke University’s Gothic-inspired buildings have become synonymous with beautiful university architecture. Most notably, the Duke Chapel, with its heaven-reaching spires and ornate stone work, is one of the most recognized buildings in the United States. Much of the chapel was designed by Julian Abele, one of the most prominent African-American architects. Throughout its history, the chapel has earned a number of awards for its architectural and historical achievements. Other architectural gems on the Duke campus include the Karl and Mary Ellen van der Heyden Pavilion and the Rafael Vinoly-designed Nasher Museum of Art. Like the other Washington D.C. schools, American University largely benefits from its location in the nation’s capital. The 84-acre campus is officially registered as an arboretum, and therefore provides an attractive collegiate setting within a bustling metropolitan city. The campus buildings are characterized by Federal-style architecture (such as the stately McKinley Building), though some of its most beautiful buildings are actually much more modern. The latter includes the Katzen Arts Center, a state-of-the-art performance hall that is popular with American University students as well as D.C. locals. In 2010, the School of International Service moved into a new LEED Gold certified building, the first on campus. Walking around the Stanford University campus, one would never know judging from the beautiful college grounds that the top-ranked university has been destroyed twice by large earthquakes (1906 and 1989). Students and visitors enter the main quad area via the stunning Palm Drive, a tree-lined road that gives way to large expanses of lush lawns and gardens. The University’s self-proclaimed architectural crown jewel sits at the head of the quad: the Stanford Memorial Church. Built in 1903 by Boston-based architects Shepley, Rutan and Coolidge, the church includes wonderfully unique examples of Romanesque and Byzantine details, including a multi-colored mosaic on the facade. To top it off, the 8,000-acre campus boasts stunning views of the San Francisco Bay. The campus of George Washington University is full of iconic buildings, statues of American heroes, large open spaces, and legendary landmarks. University Yard is the favorite hangout spot for students. Here, they can enjoy an open green dotted with benches, trees, rose gardens, and two famous statues: one of George Washington and the other of a bronze hippopotamus. Three European-style clock towers can be seen from the quad, as can a series of Federal-style brick buildings that are some of the oldest on campus. Other architectural campus gems include three ornamental iron gates, a group of Victorian townhouses now used as restaurants and shops, the Lisner Auditorium, and the Gelman Library, among many others. The most beautiful urban campus in the United States belongs to the University of San Diego. The small private university is situated atop a hill, and therefore provides stunning panoramic views of the Pacific Ocean, San Diego Harbor, the Coronado Islands, and La Jolla. Nearly every building on campus was done in the 16th Century Spanish Renaissance architectural style, a style consistent with the university’s Catholic roots. One of the most magnificent buildings on the 180-acre campus is undoubtedly Immaculata Church, which is decked out in unique details that include a door made of solid bronze, Spanish-inspired red-tiled roofs, and a mosaicked dome. Click here for a high resolution version of the award badge, which you are free to use in your publications.